Wheel weighing 10000 kg. 700x450. OIML verification included. Wireless plattform. Platform dimensions: 750x561mm. Height 58mm. Weight approximately 28kg. Sturdy structure, made in special aluminium, which guarantees lightness and makes these platforms suitable also for harsh working conditions. Sturdy built-in weight indicator, protected thanks to an IP68 hermetic box. Power supply: internal rechargeable battery (about 40 h battery life), kept in hermetic box, and charger included. Availables in legal for trade approved version. Availables in high resolution version. 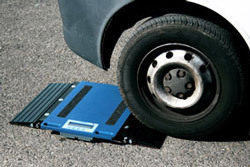 - In the single-platform systems, not used to weigh vehicles. - In the wheel weighing systems in which the number of platforms is equal to the number of vehicle wheels. - In the axle weighing systems composed of one or more multiples of WWS platforms, except possible limitations of use for some European States. The CE-M legal for trade divisions indicated in the "version" table are available with ECEM option. ECEM option is needed for each legal for trade platform of the system. In the example, an application with 2 WWS-R ramps. 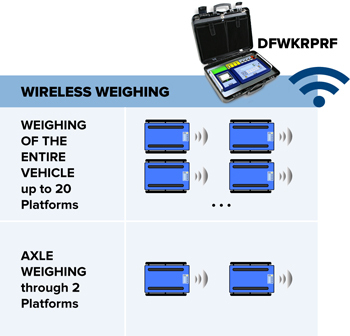 Example of application with wireless platforms and DFWKRPRF indicator for the reading and printing of the weight through a remote indicator. 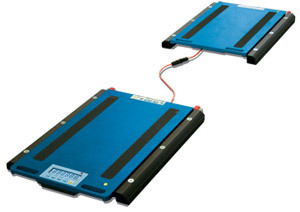 The WWSDUAL option allows you to connect the analog WWS platform directly to the WWS RF platform, without adding modules or batteries, achieving a compact axle weighing scale, versatile and lower cost. You can use the integrated indicator to totalize axles manually or by remote control, to connect via Bluetooth with tablets and smartphones, or to pair scales and create an axle weighing station using the weight indicators in a suitcase.